It's usually the hardware that makes a proper flagship - be it the chipset, the camera sensor, the screen resolution or the amount of RAM. Yet, it's only half the work done. The other half gets delivered on the software end. And we don't just mean a custom launcher or skin. Sony for example have put a lot of effort in its own gallery, music and video player. There are connectivity apps too that boost your experience with connected devices such as TVs, PCs, etc. The gallery on the Xperia Z is called Album and it's among the most fluid and visually appealing apps you could find on any smartphone platform. Images are organized into stacks of thumbnails and sorted by date. You can opt to show all of your albums in one place, and there are three tabs above the stacks - Pictures, Map and Online. Pictures is the main tab and one of its features managed to impress us: you can pinch to resize the image thumbnails. The whole thing is super responsive and hundreds of thumbs fall in and out of differently sized grids with cool animation. The Online tab displays pictures from Google Picasa and Facebook. You have options to tag, like and comment on Facebook photos. The BRAVIA engine enhances contrast, colors and sharpness, while simultaneously reduces noise, but the truth is videos and images still look better on the HTC Butterfly superior display. HTC's gallery isn't as rich in terms of visuals but gets the job done. It's the go-to place for both stills and video, pooling everything together. It can also sync your albums on Dropbox, Facebook, Flickr, Picasa and SkyDrive, which is a step up from Sony's online coverage. Wherever you choose you'll get to a familiar screen - stacks of photos arranged in albums. There is a dropdown menu where you can sort the photos by Events - which is to say, the date they were taken. The app automatically locates images and videos, no matter where they are stored. You can also choose to hide specific folders (for instance a dedicated Album art folder), so that they don't get in the way of your picture browsing. Once you pick one of the "stacks" (each representing a folder), you're presented with a grid of the photos inside. Some photos have an icon indicating it's not a single photo but a burst shot instead. You can later go back and pick the one to be used as a thumbnail. 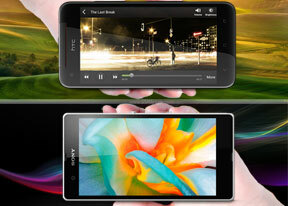 Both smartphones boast 1080p screens with a massive 5" diagonal that's more than enough for watching movies on the go. As such they need proper video codec support to let you enjoy the full experience but the software that displays the content is equally important. Both the Xperia Z and Butterfly managed to play just about every video we threw at them. Xvid, DivX, MKV were all fine (save for some dodgy ones we have with the MPEG audio 1 and 2). Both phones struggled with AC3 audio codecs but that's common for most smartphones out there. Anyway, the HTC Butterfly and Sony Xperia Z are on equal footing when it comes down to codec support. The video player of the Xperia Z is dubbed Movies and it too has a new interface. It's connected to Gracenote, which helps you find additional information about the movies you have preloaded - although it identified our version of The Mask not as the famous Jim Carrey flick, but rather a horror movie from 1961 by the same name. The video playing interface is nothing out of the ordinary. It has a slightly WP8-influenced interface with an overlay featuring play/pause and FF/rewind along with a timeline, which can be scrubbed to jump to specific scenes. There's an option to "throw" the video to a connected BRAVIA TV set, as well as an ample sound settings menu. You can enable surround sound, clear stereo (which reduces channel crosstalk) and if you're watching a video with the built-in speaker instead of headphones you can enable xLOUD and Clear Phase (which automatically adjusts the quality). In truth we found only the clear stereo and surround sound options to really make a difference. Finally you can hop into the display settings straight from the video player. As we said, the video player on the HTC Butterfly is built into the Gallery app - there's no dedicated shortcut inside the app drawer. The video playing interface has a view mode toggle (full screen or best fit) and you can scrub through videos. There's a shortcut that lets you adjust screen brightness and another one to take screenshots of videos. Overall the included options are more than enough and they are all implemented in a nice out-of-the-way manner. You can choose between Beats Audio or No effects. Beats is only enabled for headphones and improves the sound experience significantly. Subtitle support is available and you can manually pick a subtitle file - the only requirement is the subtitle files must be in the video folder. DLNA connectivity comes handy too - the Butterfly can stream the videos wirelessly to your TV via the 'Select player' option. The music player on recent Xperias is the Walkman and it's divided into Playing and My music panels. In the My music section, you can update your album art and music information like album, year released, and more. SensMe is included, meaning you can filter your songs by mood - upbeat, energetic, mellow, dance, etc. Creating playlists is enabled and you can also view your Facebook friends' activity if they too use the Walkman player. The Now Playing screen offers the standard music controls, shortcuts to the library, "Infinity" key and the album art. The Infinity key lets you quickly look up a song on YouTube or browse for the lyrics, among others. Sony has improved on the Walkman player's settings. There's a new ClearAudio+ option, which determines the best audio quality settings depending on the song you're listening to. There's Surround sound mode, which imitates the Studio, Club or Concert Hall experience. The Clear stereo mode enhances the perceivable stereo channel separation. And audio fans will be pleased to know there is a configurable 5-band equalizer with bass adjustment. However die-hard audiophiles might prefer additional players, which sport a 10-band or even 20-band equalizer. The Music app on the HTC Butterfly starts off by offering you several shortcuts - music library on the phone, SoundHound track recognition, TuneIn Radio or 7digital. Below is a line that shows a recently played song and further down is the currently playing song. Once you get into the music library available on the phone you get a dropdown menu to browse it by artist, album, playlist or genre. There's a search tool, too. The HTC Butterfly has the Beats Audio logo stamped on the back, which means your sound is enhanced to boost the sonic experience - you can use it with any headset you want. The problem is that turning the Beats option on and off is just about the only thing you can do. We would have liked to be able to save our own equalizer settings or at the very least been able to choose from a few presets. SoundHound is built right into the music player and is the track recognition of choice for HTC and they've even integrated it into the music player UI. It easily ID's a song from just a short sample. Or you can say the name of the artist and song and SoundHound will find it for you, including lyrics. The free app however only offers a limited number of uses (99). Winner: Xperia Z. The Sony smartphone gets the nod here on account of its dedicated video player, the eye candy gallery and a music player with richer settings menu and more room for audio output tuning.